Allegory, or extensive use of symbolism in a moralising story, has a long tradition in Christian literature. 'The Desert of Religion', a poem in a northern English dialect, uses the symbol of a forest to expound the daily spiritual battle of virtue and vice. This copy has tinted half-page drawings of devotional figures with verses inscribed around them. 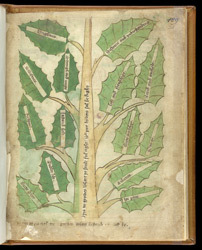 Facing them, diagrams in the shape of trees bear the names of virtues and vices on their trunks and leaves, giving visual form to the poem's allegory. The book was made for a religious community, the location of which is now unknown. At the end of the poem, this tree bears the rewards of virtuous behaviour and resistance to sin. Each of its holly-like leaves is inscribed with one of the 'blisses': joy, brightness, swiftness, understanding, love and friendship, etc.